The USDA Food Pyramid has its origins in the practice of agricultural chemistry in the late 1800s. Wilbur Olin Atwater, Ph.D., an agricultural chemist who founded and directed the Office of Experiment Stations (OES) for the USDA, wrote the first dietary guideline. Atwater was a researcher, and received government funds to build a large respiration calorimeter for studying human metabolism. 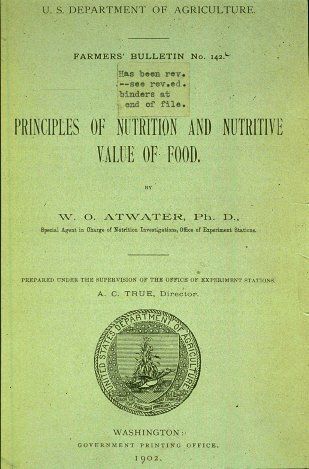 In 1902, Mr. Atwater published a USDA Farmer’s Bulletin which emphasized the importance of variety, proportionality, and moderation in healthful eating in the diets of American males. In his research, he determined that the calorie was a means to measure the efficiency of a diet. He calculated that different types of food produced different amounts of energy, and he stressed the importance of a cheap and efficient diet that included more proteins, beans, and vegetables, and to limit the intake of fat, sugar and other starchy carbohydrates. 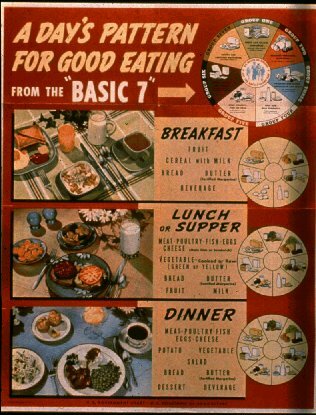 There were changes to this basic guide to help families during the wartime rationing, but it wasn’t until 1940 when the first "Recommended Dietary Allowances (RDA)" was released from the National Academy of Sciences that the USDA changed its recommendations again. In 1967, CBS aired a documentary on TV, Hunger in America which reported the extent of hunger and malnutrition among low income groups in the United States. This show galvanized the American people into demanding the expansion of federal food assistance programs. In 1968, the Senate appointed Senator George McGovern to chair the "Select Committee on Nutrition and Human Needs" with the goal of wiping out hunger and malnutrition in the US. By 1969, the committee had succeeded in wiping out malnutrition, and wanting to secure further funding, it began looking into other areas of health and nutrition. "It was Senator George McGovern's bipartisan, nonlegislative Select Committee on Nutrition and Human Needs--and, to be precise, a handful of McGovern's staff members--that almost single-handedly changed nutritional policy in this country and initiated the process of turning the dietary fat hypothesis into dogma." "Then resident wordsmith Nick Mottern, a former labor reporter for The Providence Journal, was assigned the task of researching and writing the first "Dietary Goals for the United States." Mottern, who had no scientific background and no experience writing about science, nutrition, or health, believed his Dietary Goals would launch a "revolution in diet and agriculture in this country." He avoided the scientific and medical controversy by relying almost exclusively on Harvard School of Public Health nutritionist Mark Hegsted for input on dietary fat. Hegsted had studied fat and cholesterol metabolism in the early 1960s, and he believed unconditionally in the benefits of restricting fat intake.."
Upon release of the guidelines, the cattle, egg, and dairy industries went ballistic. Congress was telling people that animal products were bad for health! The intense pressure from these industries forced the committee into revising the report in late 1977. But the damage had been done, and American meat, egg and milk consumption continued to fall. Because the goals of this document were so different, the USDA did not adopt them at first. In 1980, the USDA partnered with the Health and Human Services department to issue the first edition of the Dietary Guidelines for Americans, which eventually became the USDA Food Pyramid. During the 1980s, several other guidelines and reports were issued by various agencies. These included the Surgeon General’s Report on Nutrition and Health, and the National Research Council’s Diet and Health Report. Both reports were heavily influenced by the low fat proponents. The USDA leaned heavily on these reports in the revision of its USDA Food Pyramid guidelines in the early 1990s. Interestingly, the actual graphic for the USDA food pyramid came from Sweden. 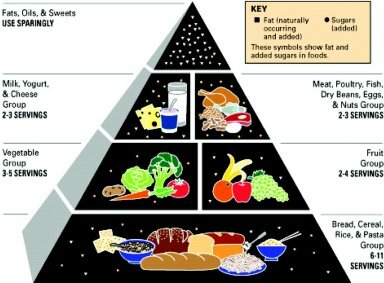 In 1988, several USDA scientists obtained copies of Sweden’s food pyramid at an international conference, and used it as a graphical basis for a new guideline in the US. (Not a smart move, since Sweden’s heart disease death rate is even higher than the US rate). The result was the 1992 USDA Food Pyramid. This graphical depiction of the USDA’s guidelines has been the source of government food advice since then. Even though multiple studies from many different sources have confirmed the efficacy and healthfulness of a low carb, whole foods diet, the USDA food pyramid still does not reflect current scientific research results. How is this possible? At least one account alleges that the original food pyramid design was much higher in fruit and vegetable recommendations, but the office of the Secretary of Agriculture revised it to push more cereal grains and processed foods. The USDA revised the food pyramid in 2010 and again in 2016. As expected, the panel of "experts" advising the USDA were all proponents of the low fat, high carb diet. The wealth of gold standard research supporting a lower carb diet and reduced grain consumption was reviewed, and sure enough, ignored for the most part, and the pyramid continues to recommend the products that benefit agricultural and food processing interests. Dr. Richard Feinman discusses this denial of the facts in this paper. The latest development in the USDA Food Pyramid history has seen the pyramid dismantled in favor of the new and "easier" to understand USDA "My Plate." At last check in January 2018, the same bad dietary advice is still being offered.